Thanksgiving is almost here. If you’ve dried aromatic leaves for seasonings, you may want to use them this holiday season. 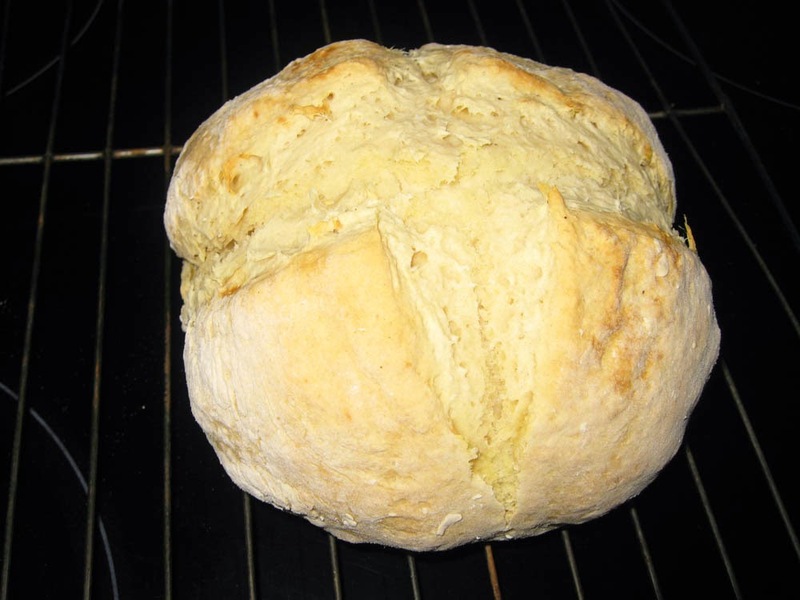 Here are two easy bread recipes featuring native plant seasonings. They may be just what you need for an appetizer. 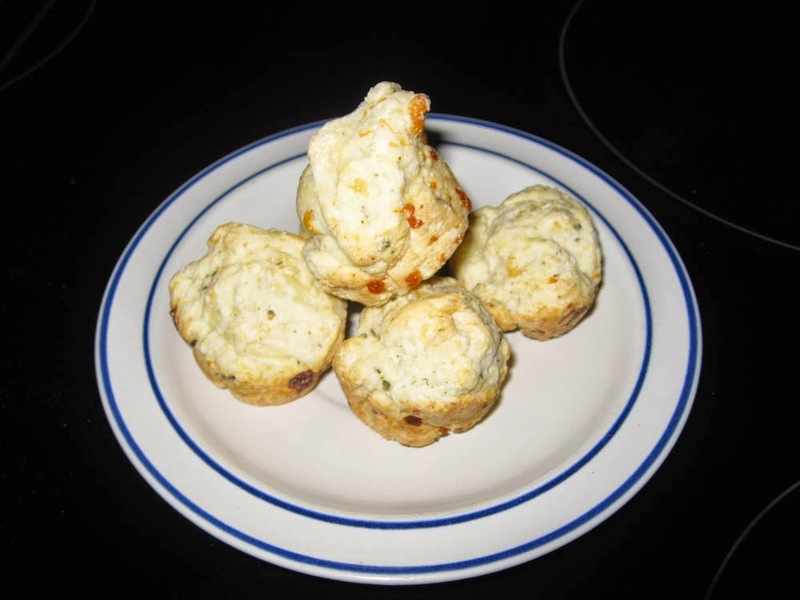 The California Cheese Biscuits add a California touch to any party. They are quick, easy and particularly tasty when flavored with native Salvia(s) or California sagebrush (Artemisia californica). You could also make them with non-native herbs like rosemary, thyme, basil, etc. Make them regular size and serve them with a holiday meal. Or use a mini-muffin tin to make bite-sized appetizers. We offered the ‘bites’ at our last Second Sunday Stroll - folks of all ages liked them. The California Soda Bread is another easy way to incorporate California flavors into a holiday meal. 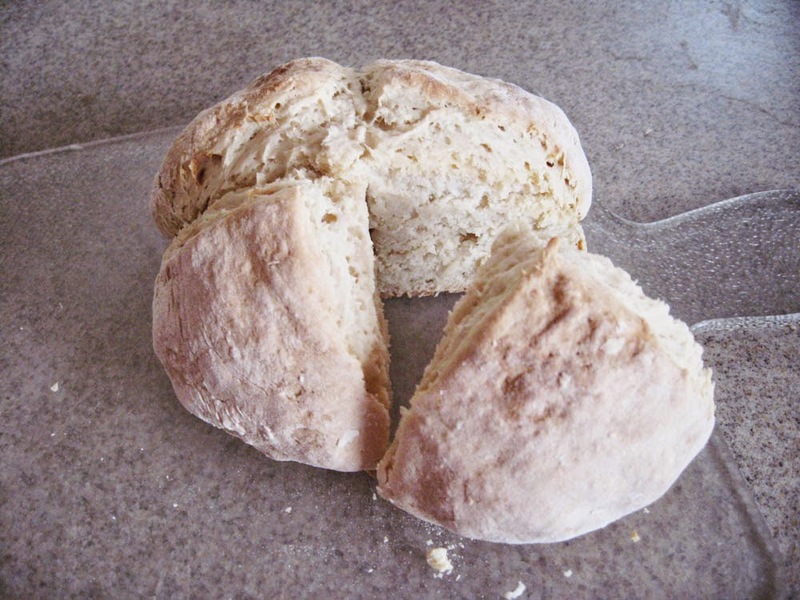 Soda Bread is easy to make and tasty. We particularly like it as an appetizer with slices of cheese or a favorite spread. If you have leftover turkey, it can also be used for sandwiches or toasted and used with creamed turkey. For use in these recipes, the sage (Salvia species) or other leaf herb needs to be fully dried, then finely ground with a spice mill or mortar & pestle. Remove any large chunks prior to measuring. Some native spices, particularly some sages and the sagebrush, are strong flavoring agents. We suggest using the smallest suggested amount the first time you make a recipe. Increase the amount, if needed, the next time. You can use spices separately or combine them according to taste. Be creative! Preheat oven. Add the spice and grated cheese to the Baking Mix. Stir well to mix. Prepare biscuits according to package directions. Grease muffin tins with vegetable oil (or use a pan spray). Spoon dough into prepared tins (fill about 2/3 full). Bake according to package directions. Serve warm or cold. Preheat oven. Lightly grease a baking sheet with vegetable oil. Mix flour, spices, baking soda and salt in a large mixing bowl (a 12 cup or 3 liter bowl is perfect). Add the milk and stir to form a soft ball (if too sticky, add a little more flour). Turn out onto a floured pastry cloth* or floured surface. 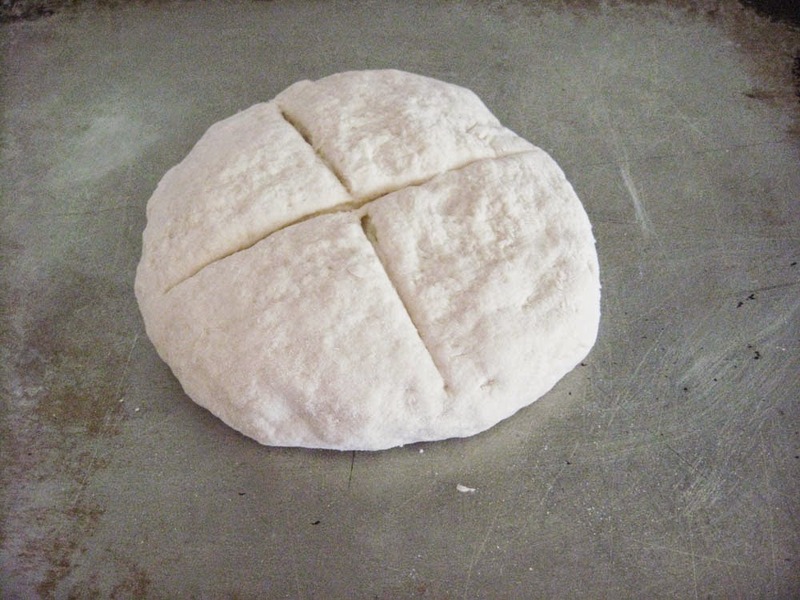 Knead until dough is smooth and holds together – about 1 minute. If using for appetizers, divide the dough in two. Form two rounded mounds on the baking sheet, each 4-5 inches in diameter and about 1 ½ inches thick. Using a knife, cut a deep ‘X’ extending almost to the edges. Bake until the breads are golden brown and the bottom sounds hollow when tapped – about 15-20 minutes for two smaller breads, 30-35 minutes for a single larger loaf. Cool on a cooling rack. For appetizers, cut the loaf in quarters. Slice each quarter thinly. 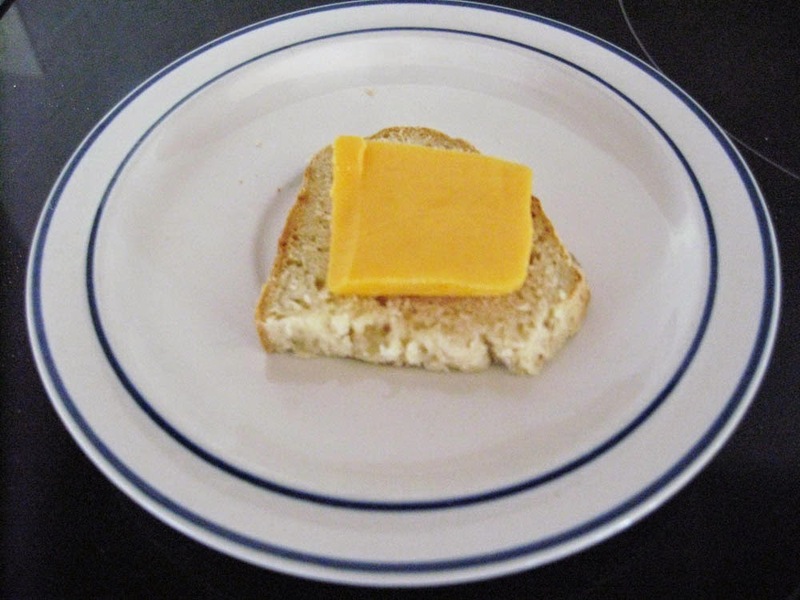 Serve with slices of cheese, fresh vegetable slices, cream cheese or other toppings. Mother Nature's Backyard in November: illustrating life-friendly fall pruning. Late fall and early winter are important pruning times in Southern California gardens. 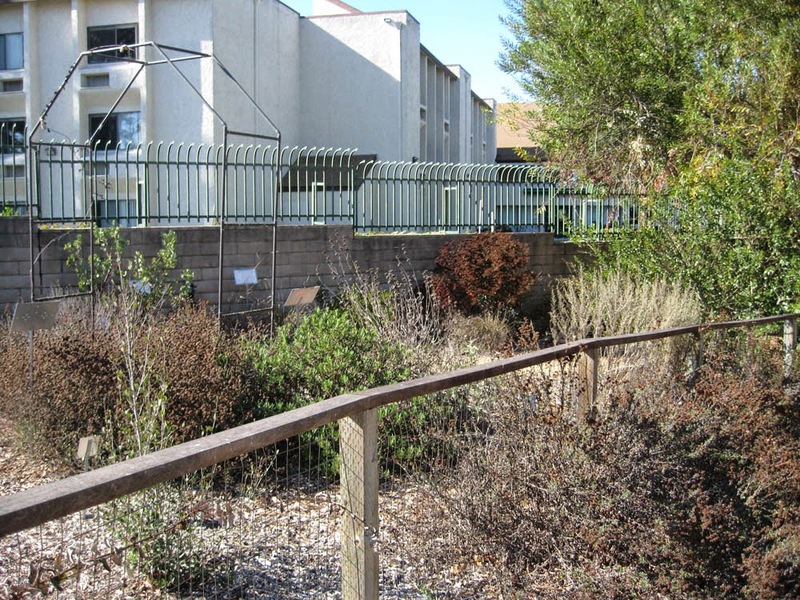 Many California native plants, particularly those from drier low elevations, are dormant from late summer until the winter rains. That’s why fall has traditionally been a major pruning season. To get a better sense of the seasons in S. California gardens see: http://mother-natures-backyard.blogspot.com/2014/09/seasons-in-southern-california-garden.html. California is known for weather that varies dramatically from year-to-year. Seasonal effects are only somewhat predictable; thus the timing of ‘fall pruning’ needs to be flexible and based on conditions at hand. There is no ‘one size fits all years’ rule for when to do fall pruning. Several considerations should influence the timing of fall pruning. First, the wise gardener respects the plants’ health and welfare. Pruning – even necessary pruning – is stressful; temperatures should be cool enough that plants aren’t unduly traumatized. Wait until the temperatures are ‘fall like’ – and don’t prune when hot Santa Ana winds are predicted. On the other hand, pruning is best done before the yearly growth spurt. Thus, pruning should be completed before winter rains commence in earnest – usually late November or December under current climatic conditions. Dry season pruning also discourages fungal infections, which can spread through pruning cuts in damp weather. Another factor impacting fall pruning is the desire to ‘tidy up the garden’. This is a noble aim – most of us enjoy a garden that’s at least somewhat neat and tidy. By the end of summer, some plants are beginning to look a little raggedy. Many native plants have completed their flowering (or will do so in early fall). The temptation is to dead-head those spent flowers – or to commence pruning in earnest – all in the interest of garden aesthetics (or the neighbor’s good graces). Which brings us to a third consideration for fall pruning: preserving habitat. Birds, insects and other creatures depend on fruits (including dried), seeds and insects found on fall plants. Your fall garden is an important source of food; concern for habitat should also figure in the timing of fall pruning. If you garden in S. California, you’ve no doubt noticed that different birds visit your garden in fall and winter. California is an important stop for birds migrating along the Pacific Flyway – a giant bird ‘freeway’ in the sky. Some birds just stop to refuel; others spend the winter in our delightful wild-lands and gardens. Either way, these birds – along with resident birds and insects – require food in fall and winter. The past two years have been particularly hard on California wildlife. Even with decreased water use, our gardens are still wetter and more productive than the drought stressed wild-lands. That’s why we’ve seen more wildlife than ever in our gardens this year. From native pollinators and butterflies to large animals like deer, creatures are desperate for food and water - and so they come to our gardens. As wild-lands suffer from climatic extremes, our gardens play an increasingly important role in providing food, shelter and water. In all years – but particularly in years when food is scarce – we need to manage our fall pruning responsibly. Buckwheats are left un-pruned until late fall to provide food for birds. Wait a bit later to begin your fall pruning. Instead of beginning in early October, wait until November if possible. There are usually dry periods, even in December, when pruning can be completed. Don’t prune all your plants at once. Plants in the Sunflower family, the Buckwheats, Sages (Salvias), plants with fruits/berries and summer-flowering wildflowers like Evening primroses are important sources of fall food. Wait until the seeds are mostly gone before pruning them. If you must prune, at least put the seed heads on your bird feeder. Watch your garden; if birds are visiting a plant, they may be eating insects. Postpone pruning it as well. Prune other plants to make your garden look neat – save the food plants for last. Prune selectively. 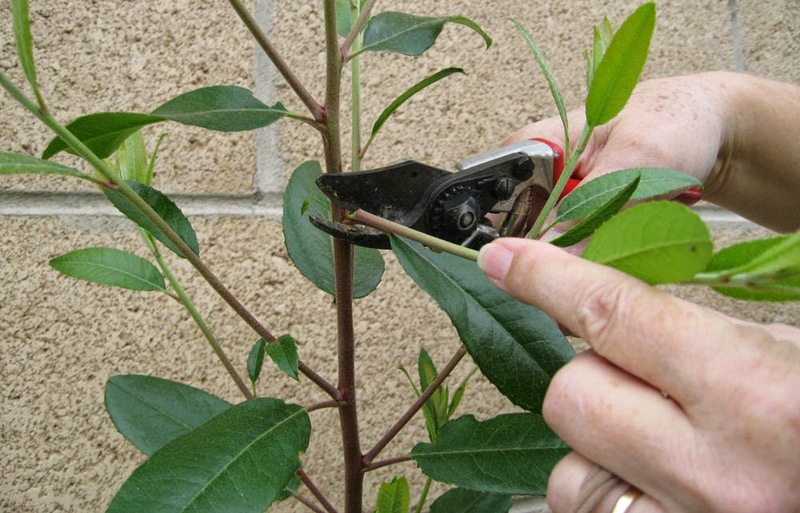 Some plants – particularly those in public places – need to be pruned to keep the neighbors happy. No one likes a front yard that looks abandoned! So prune the most visible plants first, leaving those that are less visible for later. We sometimes prune the visible half of a Salvia (for example, that nearest a walkway) in late summer or fall, leaving the back half for later. That achieves both aims: neatness and food. Don’t prune all of a species at once. If you have several golden bushes, prune some of them and leave others to prune later. Educate and encourage your neighbors. Post simple signs that explain why you’re retaining some plants, un-pruned for now, as food for birds and butterflies. Most will respect your decision to prune responsibly. Some may even change their own practices, based on your gentle persuasion. 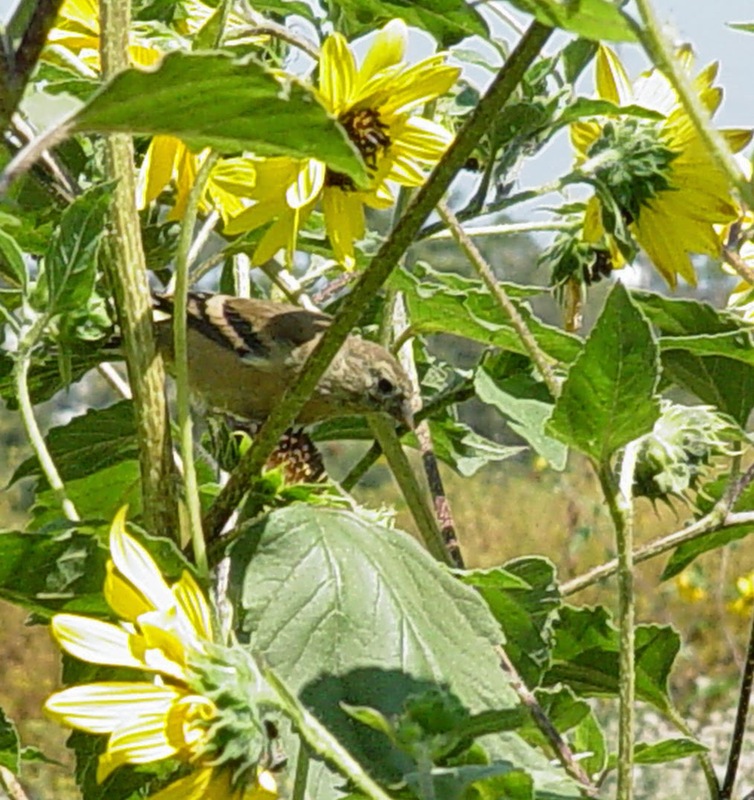 Lesser Goldfinch eating Annual sunflower seeds. We value your comments (below). You can also contact us directly at mothernaturesbackyard10@gmail.com. If you’re new to sustainable gardening, you probably have only a vague idea of how to design, install and maintain a new garden. That’s why the New California Garden series was developed. We walk you through the steps, give you helpful tips and suggest resources for creating and maintaining a ‘California-friendly’ garden. 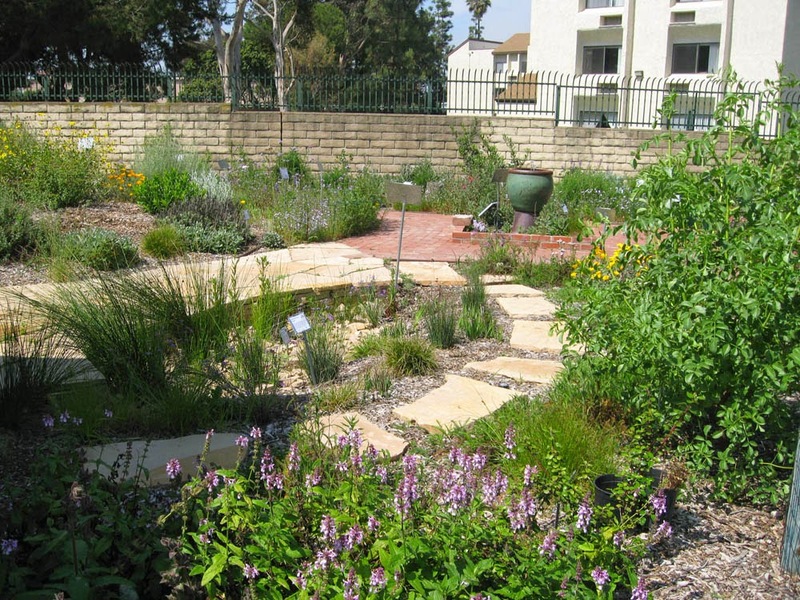 If you’re just joining the series, we suggest you start with ‘Designing Your New California Garden’ (July 2013 - http://mother-natures-backyard.blogspot.com/2013/07/designing-your-new-california-garden-1.html) and work forward. The monthly activities will help you design an attractive and functional garden. In ‘Maintaining Your New California Garden’, we focus on the nitty-gritty aspects of installation and maintenance. The series includes posts on soil amendments, planting, mulches, watering, pruning and much, much more. We hope this series will make it easier to maintain your water-wise, life-friendly sustainable garden. The area around the rain garden in Mother Nature’s Backyard gets a little extra water – about every 2-3 weeks this summer and early fall. That helps the groundcover plants establish – and keeps the whole area a little greener. One of the plants that’s blooming right now is the California woodmint, Stachys bullata. This isn’t its peak season, but the flowers keep our hummingbirds and the few remaining butterflies happy. California wood mint is a member of the mint family (Lamiaceae), a large family that includes culinary mints and the Salvias. Plants in this family often have aromatic foliage and are used for cooking and potpourri. Within the Mint Family, the wood mints (hedge nettles), genus Stachys, make up one of the larger genera. Stachys species can be found on most continents and many are used in traditional herbal medicine. The Wood mints are also known by the common name ‘hedge nettles’, a name somewhat descriptive but also quite misleading. Stachys species likely grow under hedges – the shady, somewhat moist conditions being much to their liking. But Stachys resemble nettles in appearance only. The leaf shape and emerging plants are somewhat nettle-like. But the Stachys are mild mannered; they do not sting like the Stinging nettle (Urtica dioica), a plant from an entirely different plant family. We suspect that gardeners have been dissuaded by the name ‘Hedge nettle’; we prefer the name ‘Wood mint’ for these delightful plants. 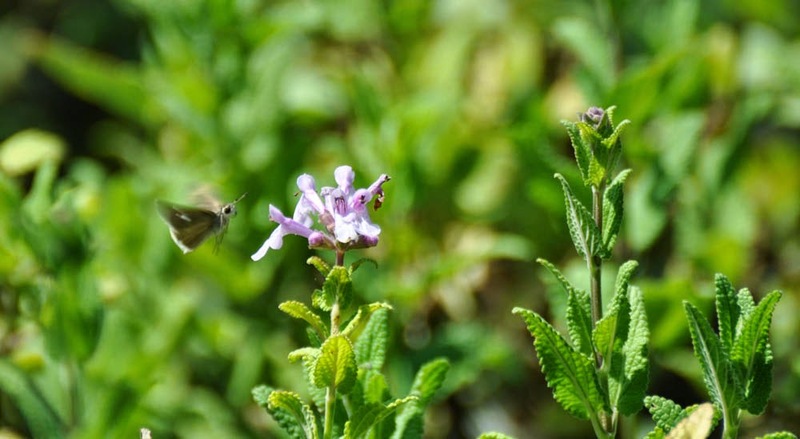 The California wood mint can be found in coastal California from the San Francisco Bay to Orange County. Locally it still grows in the Santa Monica Mountains and in a few places on the Palos Verdes peninsula. 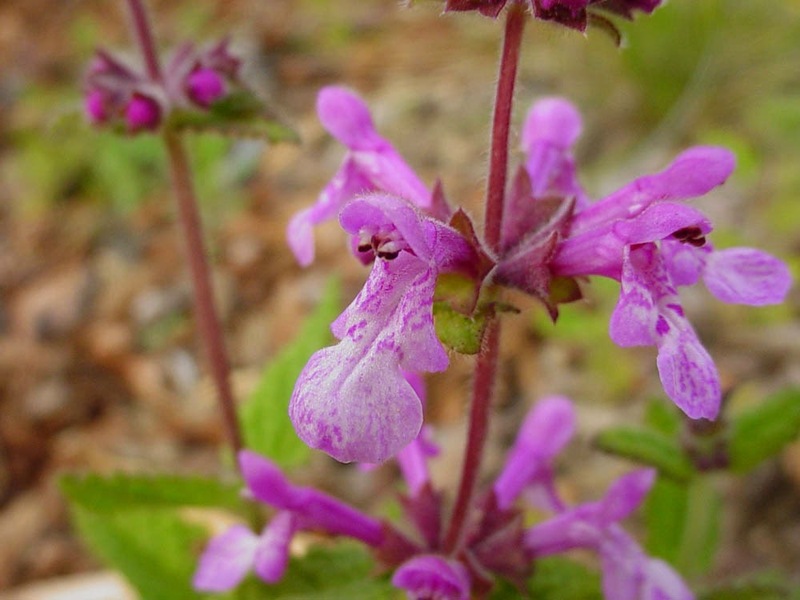 It most commonly establishes on summer-dry, north-facing slopes or moister canyons in the coastal sage scrub, chaparral, oak woodland or riparian woodland communities, at elevations less than about 4000 ft.
California wood mint (Stachys bullata) as groundcover. Like most wood mints, Stachys bullata grows as a groundcover or understory plant (mints are common groundcovers in nature). At most 2-3 ft tall (including the flower stalks), it spreads via underground stems (rhizomes) to form patches 2 to as much as 6+ feet in diameter. Given a little summer water, it fills an area with green mint-like foliage – our idea of a perfect groundcover plant. Unlike many mints, California wood mint is not markedly minty. In our garden it has but a faint minty smell, with a slight hint of lemon, and only when crushed. Some have described the aroma as objectionable; we find it rather neutral. The leaves are medium green, softly fuzzy and oval- to triangular-shaped with scalloped edges. The foliage is similar in appearance to many garden mints. 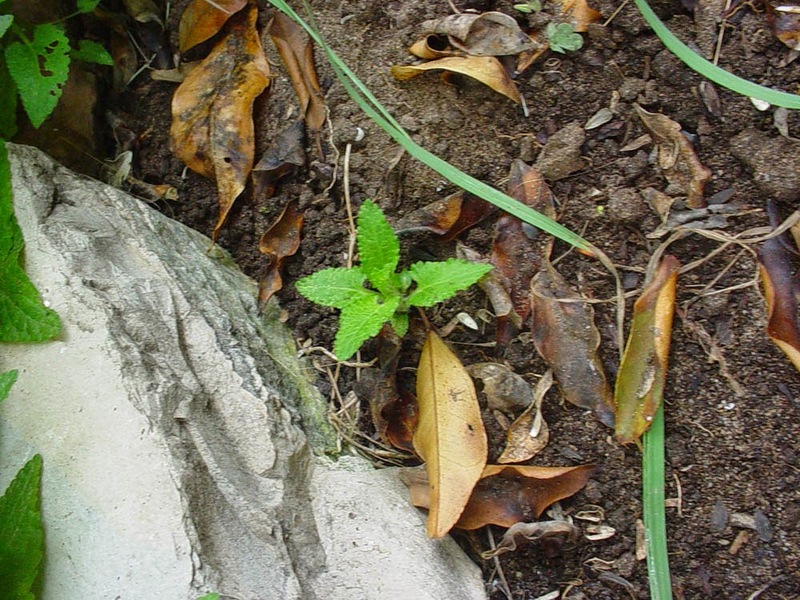 In nature, plants usually die back during the dry season, reemerging again with the winter rains. In the garden, they also die back – either when watering is tapered off in the fall or if there is a frost. When plants die back – or just start looking raggedy in the fall – it’s time to cut them back to several inches. California wood mint (Stachys bullata) - Mother Nature's Backyard. In addition to its use as a groundcover, California wood mint is grown for its flowers. The wood mints generally have larger and more colorful flowers than the culinary mints. The flowers of Stachys bullata are arranged around the slender square stems in whorls (clusters of flowers encircle the stem). This type of inflorescence (flower grouping) is typical for the mint family; you may have noticed it in garden mints. 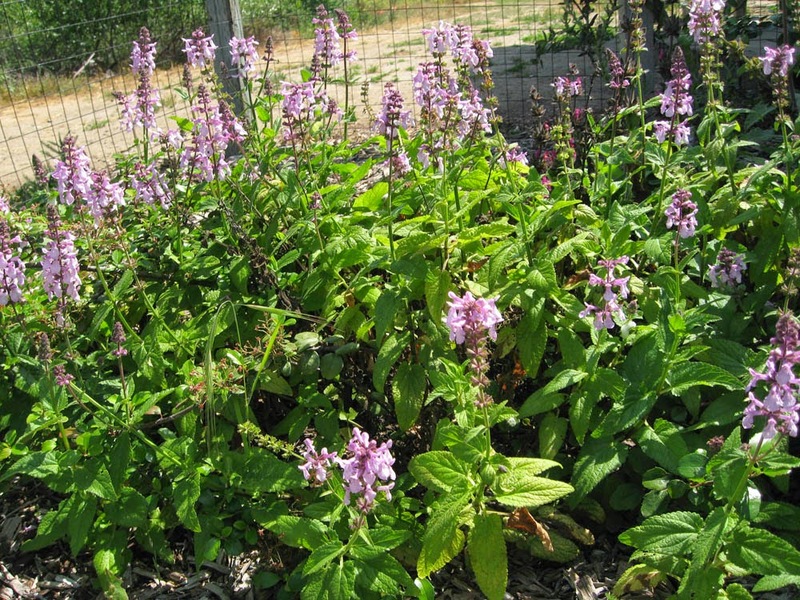 Other good examples are the Salvias – also in the Mint family – which have a similar inflorescence. 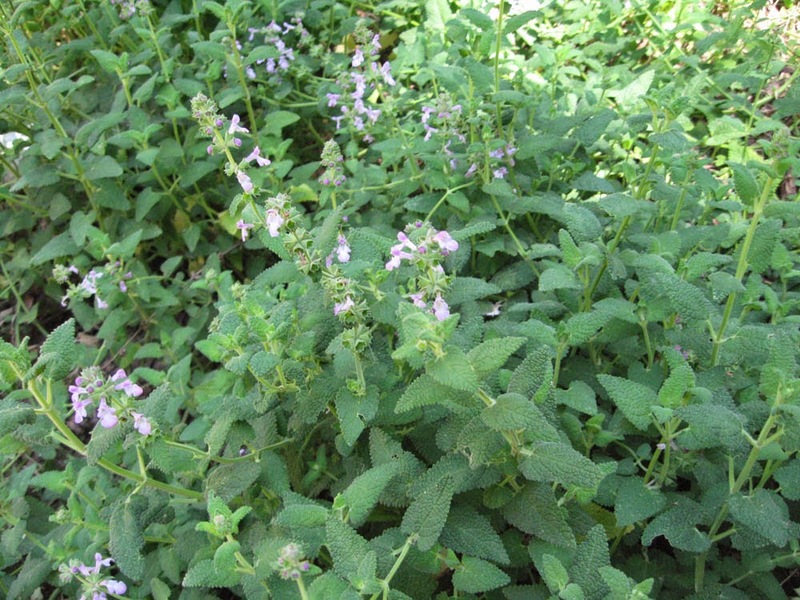 The flowers themselves are typical mint flowers. The five petals are fused into two lips, with the lower lip significantly longer than the upper. Flower color ranges from pale pink to lavender or lavender-red. The upper lip, which shelters the stamens like a cowl, is a single color; the lower lip has stripes or blotches of darker color over a pale ground (see above). The flowers are lovely and long-lasting. 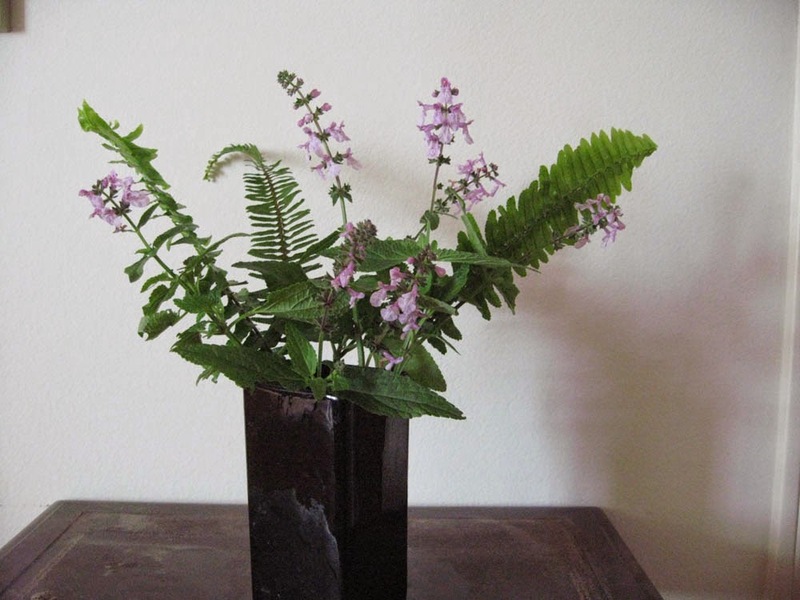 We like them in a spring/summer floral arrangement with ferns, alone or with other pink or purple flowers. California wood mint is easy to grow given the right conditions. In most of S. California it does like some shade, making it a perfect plant to grow under trees, on the north or east side of walls - even in pots on a shady porch. It will survive nicely in fairly deep shade, though the flowering may be limited. California wood mint is not particular about soil texture; we’ve grown it successfully in soils ranging from very sandy to compacted clay (it actually improves the soil texture in the latter). And it doesn’t seem too fussy about growing in the slightly alkali soils typical of S. California. While looking best with a little summer water, Stachys bullata is more drought tolerant than one might imagine. It tolerates seasonal flooding – in fact may be better for it – and looks lovely with occasional to moderate summer water. We let ours dry out a bit between waterings, in generally watering every 2-4 weeks (even during the past two years of drought). We like to taper watering off in the fall, letting the plants die back before winter. California wood mint requires little in the way of care. Snip off the dead flower stalks after birds have eaten the seeds. If the plants die back in fall, prune back to several inches to promote lush spring growth. We use a thin (1-2 inch) organic mulch (wood chips; redwood bark chips) when getting plants started. After that we let the plants provide their own leaf litter. If grown in a pot, give plants a dose of ½ strength fertilizer in spring. And if the plants exceed their allotted space (see above), just pull up the new stems as they emerge (you’ll have to cut them off). That’s really about it. So why should you consider growing Stachys bullata? Certainly it makes an easy-care groundcover, particularly in shady parts of the garden. It does great on shady slopes, helping to stabilize the soil. 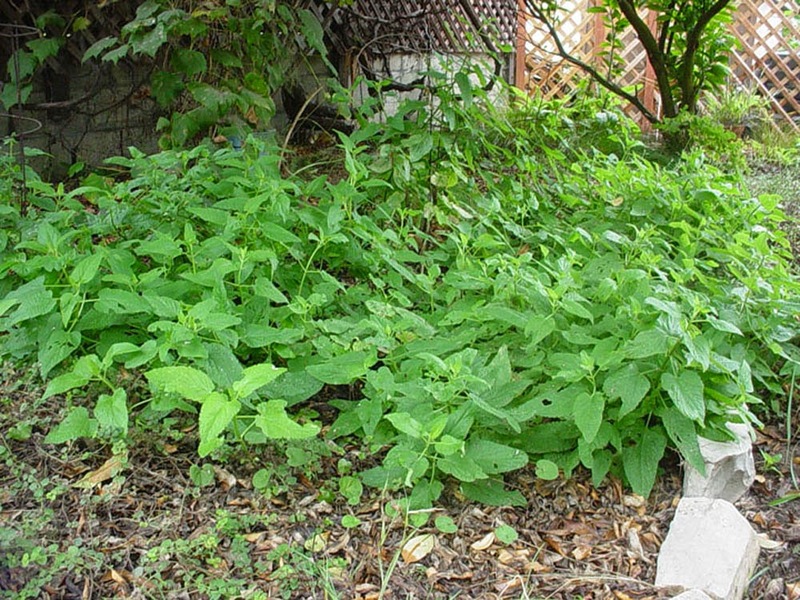 California wood mint might just solve a shady problem area in your yard. 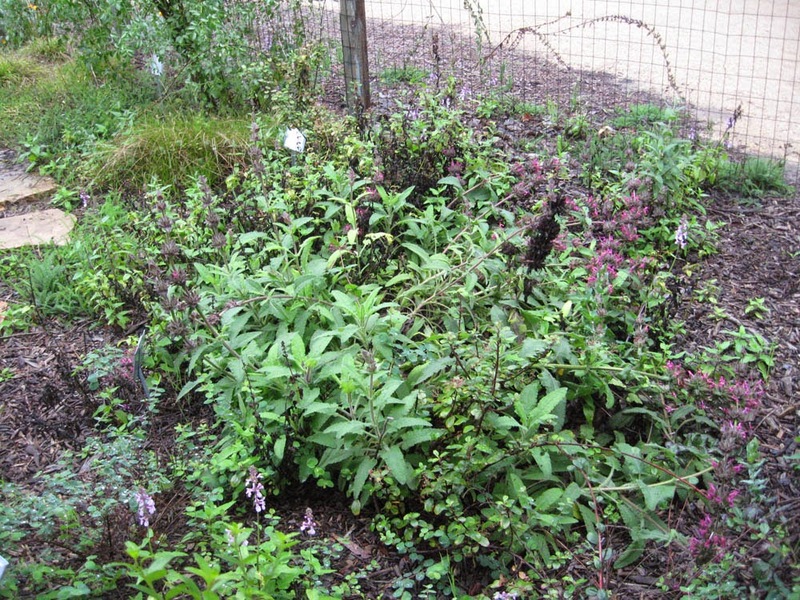 Mixed groundcover featuring California wood mint (Stachys bullata), Hummingbird sage (Salvia spathacea; magenta flowers) and Catalina perfume/Evergreen currant (Ribes viburnifolium). 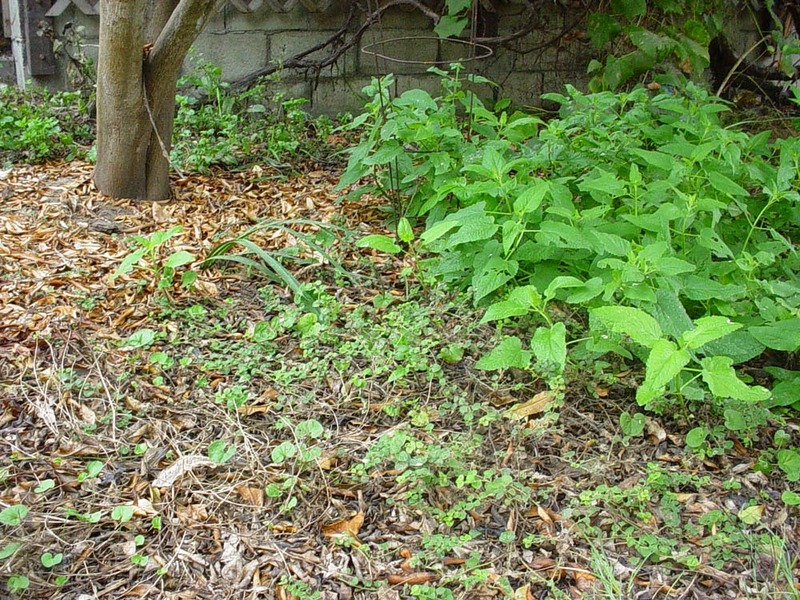 We suggest growing it with other native groundcover plants to create a natural woodsy ground cover. Yarrow (Achillea millefolia), native strawberries (Fragaria species), Catalina perfume (Ribes viburnifolium), Hummingbird sage (Salvia spathacea), native Honeysuckles (Lonicera species) and even Mugwort (Artemisia douglasiana) combine well with the wood mint. The plants share light and water requirements, making them easy to care for. A mixed groundcover can be a delight – providing interesting textures, fruits, medicinals and flowers over much of the year. California wood mint (Stachys bullata) and Yerba Buena (Clinopodium douglasii) under a Kumquat tree. California wood mint is also an important medicinal plant. Its most common use is as a topical (skin) disinfectant. Leaves/stems are soaked or steeped in hot water to create an infusion; when cool, this can used to clean skin sores, wounds, cuts and boils. Heated leaves and stems can also be pounded/ground to create a warm poultice applied to boils. An infusion/tea from Stachys bullata can be used as a gargle for sore throat; it was also traditionally drunk to treat stomach aches. As with any natural remedy (particularly those taken internally), be sure to start with a small dose; and don’t drink more than 1-2 cups of medicinal Wood mint tea per day. If a wound, sore throat or stomach ache persists or worsens, be sure to seek qualified medical care. Visiting the Garden: Directions, etc. 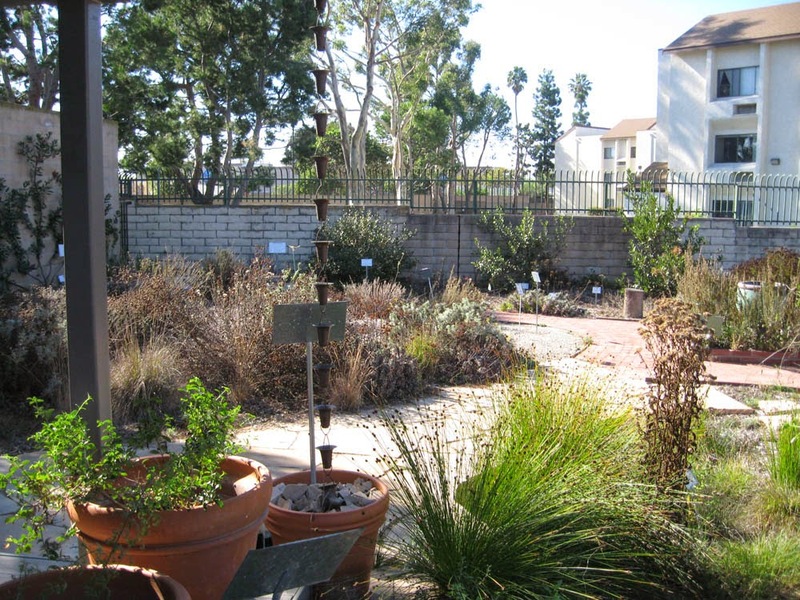 Mother Nature's Backyard is managed by the Board of the Friends of Gardena Willows Wetland Preserve. 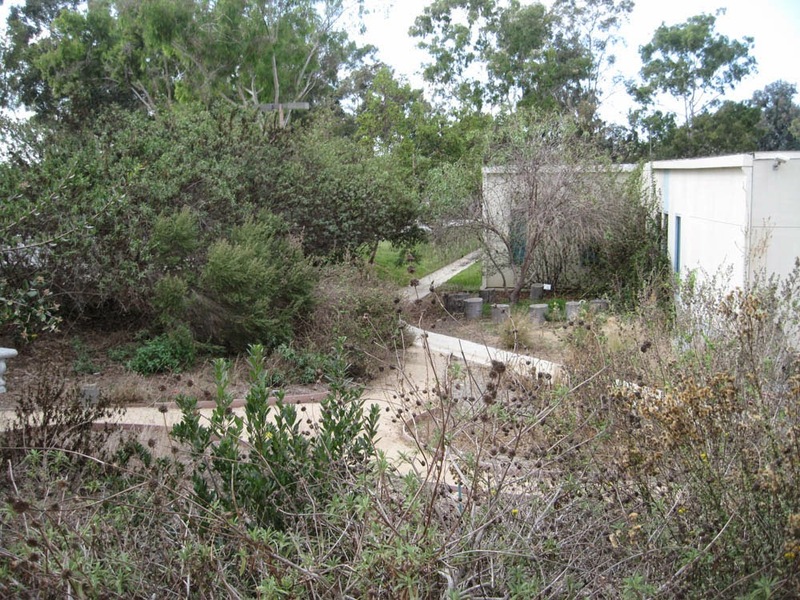 Our blogmaster and head gardener is Constance M. Vadheim, native plant gardener/propagator and adjunct Professor of Biology - CSU Dominguez Hills. Dr. Vadheim also teaches a native plant gardening series (see the Friends of Gardena Willows website).